As far as instrumentation is concerned, anything goes with jazz groups these days. No bass? No problem. Cecil Taylor proved that the bottom end wasn't mandatory in free music almost half a century ago. Groups like the Chicago Underground Duo - who make it work with just a trumpet and drum kit, plus some electronics - are fairly standard, or at least not unexpected. The music of groups like this doesn't lack anything in its simplicity, it opens things up to new opportunities. Having said that, it feels like something is missing in "Tagger," which opens the self-titled album by the Brooklyn-based quartet Bizingas. Guitarist Jonathan Goldberger and drummer Ches Smith lay down a 5/8 groove, which sounds as much like a rock riff as a jazz vamp. Brian Drye and Kirk Knuffke join in on trombone and cornet, respectively. It's a catchy three-minute tune, no doubt with room for a little blowing in the middle. But it feels like it could use something on the bottom end to fill out the sound and drive it home. 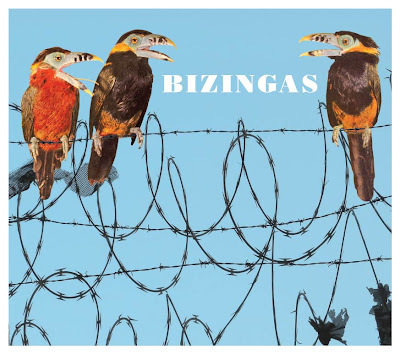 This is not to say that the guys in Bizingas need help. In fact they all come with some strong credentials. Drye, who leads the group and wrote all 10 tracks, has worked with everyone from the Tommy Dorsey Orchestra and bassist Mark Helias. He also doubles on piano. Smith's name showed up on this blog a few months ago with his excellent release with These Arches; he also has played metal and post-rock. Knuffke, also a man about town, is a member of Ideal Bread, a band devoted to Steve Lacy's compositions, to name but one project. Goldberger also has rock roots, as well as experience with drummer Jim Black and guitarist James "Blood" Ulmer. So really, the issue here is getting used to the open spot in the arrangements, really. My notes for "Guilty" - where the horns play some fast lines over the drums, before Goldberger starts comping - reads, "Needs something." The same can be said for a few other songs, yet at the same time, Drye has come up with some thought provoking compositions that expand the shape of the group with nearly every tune. They hadn't intended to record the subdued "TMT," but it gives the album its first thoughtful digression, three songs in; the piano and Knuffke's horn engage in a good conversation. 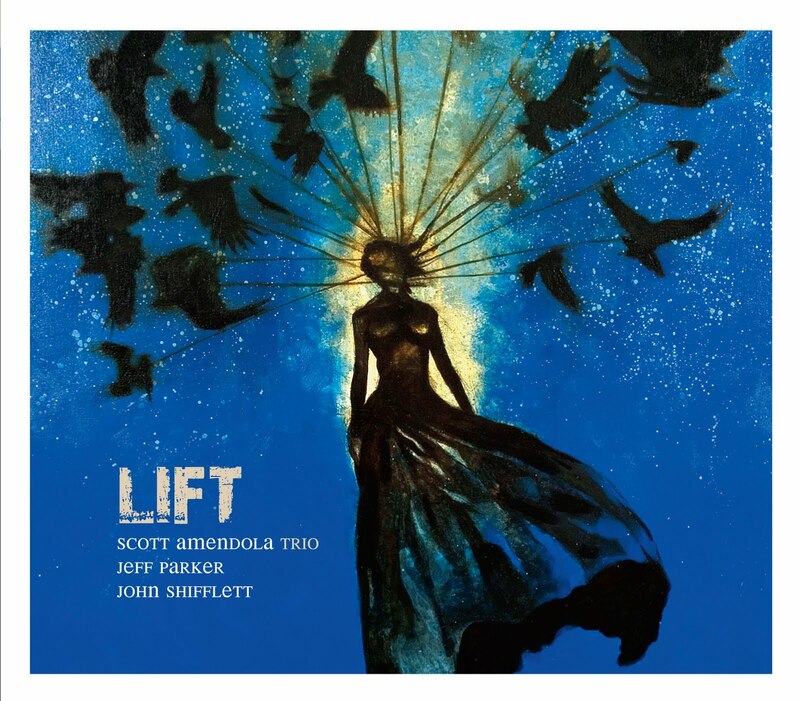 "Sifting," a ballad dedicated to Duke Ellington, has multiple sections and the quartet's minimalism works to a good advantage. "Stretched Thin" begins rubato with a repeated figure played by the trombone, that is later played more rapidly by a programmed keyboard. Smith steps away from the kit to play glockenspiel too. The minor, somewhat pensive "Farmer" is a composition with no improvisation that recalls Andrew Hill's early work. Closing the album, "Untitled Moog Anthem" is deceptive in that it's not exactly anthemic, nor is it especially moog-like. The titular keyboard does however pump out a pedal point bassline that keeps a groove going with Smith, and it kisses off the album with an idea of what else might be possible down the line with them. It's been a John Vanderslice kind of night. There is illness in the household, except for me, knock on wood. So everyone is asleep (I hope) except me. It seemed like the ideal time to pull out JV's Romanian Names album. I've been thinking I need to revisit it ever since I received my platinum package version of his new album last week, White Wilderness. What's the platinum package you ask? Welllll - lemme tell ya: It contains both the vinyl and CD editions of the new album, plus a one-sided six-song EP, Green Grow the Rushes (limited edition of 1000, mine being around #241), along with two 7"s of songs from Romanian Names with non-LP b-sides (and beautiful covers), plus a printed poster for the album and a photo by John himself, sealed in an envelope with sticker bearing his initials. The picture supposedly has never been printed before and never will again. The whole thing costs $45, which is a bit of change but was almost covered by money that I got from a recent Love Letters show. Besides, it's a helluva a lot less than the Decemberists' deluxe package for their new album, which costs $165. Of course it does have a 72-page booklet, but oh well. Speaking of the Love Letters, we played last night at Club Cafe with three other local bands. It was a pretty good time. There were folks there who were whooping for us and egging us on, so that was good. It was interesting because a few of my friends that came to see us were all from very different social circles. I always hope something like that will happen, but it doesn't very often. We played with City Steps (which includes Bill & Kate of the Hi-Frequencies), Paul Labrise & the Trees (who organized the show) and Meeka in Jail (who were flying off the rails). Our next show is at Rock 'n Bowl on Feb. 16, which I just discovered tonight is the same night Congo Powers is coming to town. Jason Stein named his trio Locksmith Isidore after his grandfather's first name and occupation. Two pieces on this album also have titles that pay tribute to his siblings: "Little Bird" to his sister; and "Sammy's Crayons" to a half-brother who liked to draw as a kid. It's clear from these indications that Stein's music gets some fuel from his personal history, and the way he utilizes these elements never comes close to maudlin nostalgia. In a similar fashion, Stein's music frequently heads into a rather straightforward direction, swinging like crazy with walking basslines and jumpy bass clarinet solos, acknowledging the music that came before him. In some ways, a lot of the tracks on this album could be considered very accessible to a more mainstream audience, and not what one might expect from someone who has played with the Exploding Star Orchestra. Yet he does this through more original means. 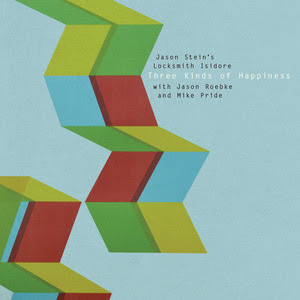 The obvious starter is this equation is Locksmith Isidore itself, a trio led by Stein's bass clarinet together with Jason Roebke's bass and Michael Pride's drums. Bass clarinets have become a tad more commonplace in jazz, but rarely does one see it as the sole voice on the frontline. Stein doesn't draw on some of the more standard trappings of the instrument - its guttural, throat clearing rasp, percussive slap-tonguing or high range wails. Three Kinds of Happiness leans more towards composition, and Stein shows off his more melodic tendencies, leaving room with the wild stuff as he sees fit. Sometimes, a tune starts off with the trio moving loosely or freely before jumping into a more structured setting ("Cash, Couch and Camper," "Ground Floor South"). "Arch and Shipp" - which could be an homage to Archie Shepp and possibly Matthew Shipp - stays outside for the first half of its nine minutes, so when the group hits the theme, the bounce in the melody sounds all the more infectious. At one point during his solo, Stein rapidly shapes and reshapes the initial theme somewhat like Coltrane and it makes you realize that being the only horn soloist is a challenging job and that he handles it was ease and skill. If "More Gone Door Gone" were scored for a larger ensemble, it could easily turn into a stomping blues. Here the trio hints at its wild potential but Roebke and Pride hold back while Stein employs some circular breathing for a double-time chattering, which is just as exciting as a wild blues and whole lot more original. A couple of live, bonus tracks profile the more wild side of the group (Stein has also recorded a solo bass clarinet album for Leo), where they take an simple idea and build up around it. Coming at the end of the disc, they serve as a good contrast to the earlier pieces like "Little Bird," a strong ballad that has some passing references to the classics. Grandpa Isidore might be perplexed at times by the trio but ultimately he'd dig them. Last week I took a stay-cation from work, with high hopes of cleaning up the home office, organizing everything in here, including the pile of CDs and getting stuff ready to auction, as well as cleaning up the rest of the house. And I expected to keep up that good run of blog entries I had in the final days of 2010 and the beginning of this month. So here it is, four days into the week after the stay-cation, and only now am I getting around to an entry to follow the Burt entry below. Eh, what are you gonna do? The weather outside is awful (which cancelled Love Letters practice tonight) and the kid is fast asleep in the next room, so it's time to get back on track. Last week Dean & Britta played at the Carnegie Lecture Hall in Oakland, drawing on Dean Wareham's Galaxie 500 catalog. They played a similar set in town last fall at a benefit for Hopital Albert Schweitzer, but last week's show was more publicized and is part of a tour. The incredible thing about the set was the manner in which the group really recreated the Galaxie 500 sound in all its subtleties. Obviously Wareham is going to be able to recreate the way he played those songs (and he sang in the falsetto perfectly), but Jason Lawrence replicated Damon Krukowski's drum style in both the accents and the way he hit his kit. Britta Phillips stuck closely to the upper register of her bass, much like Naomi Yang did, and when she slid down to the lower frets during the climax of "Flowers," it felt like pure sonic bliss. I also scribbled the words "BLISS OUT" on my note pad during a later song, which I think was "Summertime," based on an equally scribbled, half-remembered song lyric. I know the song was in A. That last statement is significant because after awhile, it felt like every song was in D, or built around D and one other chord. Of course, the initial appeal of Galaxie 500 came from the fact that all their songs were pretty similar and it didn't matter. Without the Kramer's sea-of-echo production, maybe some of that appeal was lost on me, 20 years down the road. Not that it ruined the night, though. Far from it. The only thing that detracted from the evening was the way I nodded off several times during the set, despite having had my usual p.m. cups of coffee and not having worked that day. Maybe the band was just lulling me to sleep. For Ralph Carney's tenor sax line in "Decomposing Trees," guitarist Matt Sumrow pulled out a melodica and blew the line, giving it a reggae dub atmosphere that made up for the fact that the song seemed a little too uptempo, compared to the original. (And the purist in me missed the bells that are heard at the beginning and end of the song.) Sumrow's presence was great because it kept the rhythm guitar sound chiming when Wareham took a solo. He is a really understated soloist, with the way he uses space, melody and effects pedals, and during "When Will You Come Home," he manipulated his amp by the way he stood in front of it. It was fun. For encores, they dug into their 13 Most Beautiful set and Britta sang Dylan's "I'll Keep it with Mine." True to my prediction, they followed that with New Order's "Ceremony," which always has some extra life in it. 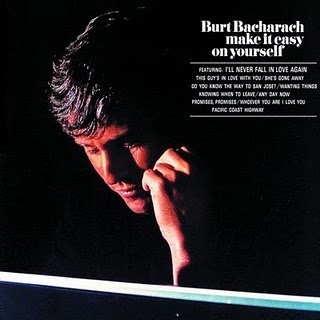 When I was about five or six years old, my dad bought a cassette version of Burt Bacharach's Make It Easy on Yourself. I played it all the time, most likely because it was there but also because I did think it was pretty catchy to my youthful ears. Pop had a bunch of pre-recorded tapes that factor heavily into my musical outlook. As I might have said before, some of my earlier musical memories involved the tapes of the 5th Dimension's Greatest Hits, Sergio Mendes & Brasil 66's Equinox and a Herbie Mann sampler with "Comin' Home Baby" and "Philly Dog." Make it Easy on Yourself found Burt leading a studio orchestra through several of his hit songs. This was one of a few albums he did for A&M, and this particular one leaned heavily on tunes from his then-recent Broadway hit Promises Promises. In some ways, this album is a textbook version of Easy Listening, with strings and warm brass and anonymous female singers cooing the words to "I'll Never Fall in Love Again," "Wanting Things," and a few stray lines in a couple other songs. In Rolling Stone's first edition of their Record Guide around 1979, they gave all of these albums a bullet rating, which meant they were worse than one-star albums, truly awful. I'm here to tell you they were wrong, wrong, wrong. Now that I have a new needle for our good turntable, I whipped out Make It Easy On Yourself, craving the instrumental version of "Do You Know The Way to San Jose." One of the beautiful things about this album is the way Burt (sorry, I can't simply refer to him as Bacharach) regularly scores the melody so each phrase moves to a different instrument while still sounding consonant. Marimba bangs out the intro here, leading to a pregnant pause before a rather Herb Alpert-like trumpet takes the first phrase. A guitar - I think - picks up the "L.A. is a great big freeway" line, leading to some other percussively stringy instrument. It's not complex, it's irresistably catchy and it helped me to think of music in visual or human terms as a kid, which kept my synapses firing. "Promises Promises" is a tour de force, one that kicks off the album at that. It's already a complex song time-wise, but there is a lot of tension and release. It begins gently and builds to what sounds like a climax, with a piano banging the chords beneath a surging brass section. Then it pulls back, brings those vocalists in for a whopping three lines, then it surges even higher into the real "bring it home" finale. It's so raucous that the drummer seems to lose the beat on the turnaround, and struggles to keep up. Maybe that's not true since the composer is such a perfectionist, but it doesn't take anything away from the song. My other favorite song on the album is "Knowing When to Leave." Yet again, the melody moves around the room, from oboe to saxophone to trumpet. But the song's strongpoint comes with the way Burt gets the orchestra to roar like a rock band, punching out the lead-in beats to the next phrase and building tension around a dangling chord alteration at the end of a line. This is sounding a little too academic. Let me put it another way - very few things, outside of Mama Cass or "Aquarius/Let the Sunshine In" fill me with such musical joy. The quiet coda of this song (also used in Dionne Warwick's version) always puzzled me, making me think of someone alone and sad after a big party is over. I prefer Sue Ramey's version, released on Imperial, where she goes back into the roaring part before the song fades out. I found a copy of it in a Goodwill once, with the flip-side being a cabaret-style cover of the Monkees' "Early Morning Blues and Greens," which isn't nearly as successful. I didn't listen to Make it Easy On Yourself at all from about age 12 until the time is about 24. That summer, something in my mind told me to find a used copy of it. My roommate thought I was nuts. He had a Burt album on our mantelpiece that he used to roll joints on. He saw no other value for the schlub on the cover. Within a year, he changed his tune. Scott Amendola starts his new album with a bit of red herring. The first 63 seconds of "Tudo De Bom" capture the drummer crashing all over his kit, from skins to pitched percussion, implying that a freewheeling tune is about to catch fire. But when Jeff Parker (guitar) and John Shifflett (bass) join him, the mood gets noticeably subdued. Parker doesn't even use any distortion (that comes later), preferring a warm, clean tremolo sound. Not that the quasi-funky, Brazilian-influenced tune lacks a strong feeling. The trio locks into a different kind of groove right away with some crisp, lean lines from Parker. But like most of the album, the trio takes a turn that isn't exactly expected. Amendola has been all over the place, musically speaking. (As I wrote here a few days ago, he's on trumpeter Sarah Wilson's Trapeze Project.) Recently, he's become known for his work in the Nels Cline Singers, but he also played with the funk group T.J. Kirk and the Thelonious Monk tribute project Plays Monk with Singers bassist Devin Hoff and clarinetist Ben Goldberg. In a certain way, Lift brings his various styles together without employing a self-conscious, obvious manner. It shows that Amendola isn't afraid to keep all his options open, and knows how to make them all work successfully. "Cascade" begins with some electronic noise that sounds like a distorted sample of a dripping faucet. It becomes a constant in an aggresive 5/4 vamp, and it duels with Parker's effects-heavy axe, before things break down into an unaccompanied Shifflett solo. After "Death By Flower" dives into distorted punk free jazz - with the drummer beautifully building the momentum of the piece - the title track comes off like a Paul Motian tune, if that drummer enlisted Jim Hall to join him. Here, Amendola uses his instrument more like an additional voice than a time keeper. For the closing "Lullaby for Sascha," dedicated to his son, the drummer brings back the electronics and subtly creates the setting of Parker playing the gentle melody on a ship drifting on the water and creaking. It might be a little unnerving for its namesake to enjoy as he's trying to drift off at night, but everyone else should admire the combination of atmospherics and simple, catchy melody. A number of drummers have been popping up lately as leaders and composers. Amendola stands out among, because he's no stranger to the format (he released Believe in 2005 with a quintet) and he also is a master composer. I forgot to go through all the albums I bought this year too, and wouldn't you know it, I overlooked one that was particularly solid. Cobra Verde's John Petkovic (another one of the most gifted songwriters around, for his ability to combine really sharp lyrical wit with hard rock that manages to be visceral without succumbing to lunkheadedness) and Tim Parnin joined forces with Dinosaur Jr.'s J. Mascis and Witch's Dave Sweetapple on this beauty. The cover art either spoofed Roxy Music's Country Life or paid heavy homage, it's hard to tell which. (The two scantily clad ladies both looked kind of homely, just like the original models.) And the music is much this same way: it's hard rock but with more brains behind it, than most people half Petkovic's age. I like music that makes you check your biases at the door, and this one does. So there are 10 albums for ya.